One of the surest signs of ecological richness and diversity of a country is the number of predator species it supports. Larger the number of predator species, the greater is the biodiversity. The existence of predators carries the implication of the presence of a much larger and more complex ecological community and millions of years of evolutionary struggle. Crocodiles are among the most efficient aquatic predators. Sri Lanka is home to two species: the freshwater crocodile (Crocodylus palustris) and the saltwater crocodile (C. porosus). The freshwater crocodile is far more numerous than the saltwater crocodile and enjoys wide distribution and good numbers, especially in the low country Dry Zone given the availability of thousands of man-made irrigation reservoirs or tanks. It is also less aggressive and much easier to live with than its brother. The saltwater crocodile by contrast is less numerous and has a much reduced distribution. Despite its name, the saltwater croc is an extremely adaptable reptile that can inhabit both freshwater and saline habitats. It is possibly the largest reptile on earth, and also the deadliest. It remains one of the most fearsome and dangerous predators on people and livestock. Crocodiles have had a bad press. They are viewed as killing machines. Despite the hype in the media, conflict between man and crocodile in Sri Lanka is not very serious. The statistics of being attacked are minimal. More people are killed by rabid dogs, poisonous snakes, marauding elephants and maniacal motorists on the roads than by crocodiles. But that does not mean we should remain oblivious to the plight and concerns of those people who have been attacked by crocodiles or have lost a loved one in encounters with crocodiles. One of the best ways in which we can minimize crocodile attacks in villages is by helping them understand the behaviour of crocodiles through a sound program on Conservation Education. The IUCN defines Conservation as “the management of human use of the biosphere for it to yield the greatest sustainable benefit to current generations while maintaining its potential to meet the needs and aspirations of future generations”. Crocodiles represent an extremely valuable natural resource, both in terms of ecology as well as economy. But the sustainable use of wildlife such as crocodiles has become one of the issues for lively debate among conservationists. Both arguments have their place. If a species is listed as endangered, then every effort must be made to protect it and its habitat. But in areas where the species is abundant and widely distributed, some management is necessary, especially if it is large, bad, and dangerous. Crocodiles are masters of camouflage able to see, hear and sense our presence without betraying theirs. They are at their best in water, and the quickest. They can remain submerged for up to 2 hours. Crocodiles take nearly all their prey on the surface water, and thus the ‘danger zone’ for getting in and out of the water. They are ambush predators and hence they lie in wait for their prey to come by. While in water, much of their body is submerged and so, only about a seventh of the body comprising the external nostrils, cranial platform, eyes and ears is exposed. Crocodiles are highly sensitive to even slight vibrations in the water through the thousands of tiny receptors dotted mainly around the jaws, which enable them to pick up even the faintest vibrations as when an animal comes to drink. Thus whatever you do, do not go into water to bathe or swim, especially in late evenings, in areas where crocodiles are present. Do not venture into the land of crocodiles without an understanding of their behaviour. This may save your life and that of others. Crocodiles also have excellent vision even in dim light. They can see almost 180 degrees but cannot see anything that is below the nose. The retina in the eye has a reflective layer called the retinal tapetum which reflects back any light passing through it thereby enhancing vision. It is said that the eyes are the window to the soul, but in the case of crocodiles they lead straight to the stomach! In crocodiles the eyes are placed so close to one another that they enjoy binocular vision which is necessary to estimate depth of field and distance to pinpoint accurately the location of the prey before lunging at it with incredible speed. In water, crocodiles can move with lightning speed. As a crocodile can shoot itself out of water at a speed of 70 km/h, it would not be wise to stand on logs or branches over deep water or dangle arms and legs into it. You will not even have time to react. Thus it’d be unwise (& impolite as well) to either urinate or defecate near water’s edge if crocodiles are around. Crocodiles have powerful jaws and their bite force can be more than 5,000 lbs. per square inch. Be extremely watchful especially at dawn and dusk when crocodiles are most active. Crocodiles, despite their small brain, They are very clever. The cerebral cortex in the brain means that they can learn, remember and make plans. They are known to study the habits of their prey species for a couple of days before striking. If an animal has a routine and uses the same spot on the river bank to drink, then the croc would wait for it the next day. Therefore people must avoid livestock and wildlife drinking places which crocodiles associate with meals. Crocodiles are extremely elusive creatures that are difficult to approach. At the slightest noise or ground vibration, crocodiles will move into water and avoid people. If you come across a crocodile, stay away from it. Even though it may look as if it is sleeping, it is quite aware of your presence. You should never provoke a crocodile, not even baby crocodiles in a nest since their mama who is extremely protective of her young, might be close by and she would not take kindly to your antics. You do not mess with the mama. The really dangerous crocs are the really big ones (larger than 6-8ft). The distance between the nostril and the eye or the length of the hind foot in inches approximates the crocodile’s total length in feet. The larger the croc, the more dangerous it is. Relocating saltwater crocodiles is not only unwise but very dangerous as well. They become highly mobile when released, often try to return to where they came from, and seem to be particularly prone to attacking people. If programmes designed to conserve crocodiles in the wild work, depleted populations can rebuild and then expand, and hence they are guaranteed to increase human-crocodile conflict. The only real way of increasing the wild populations without also increasing the problems for people, is through education and assistance where people have adopted behaviours (bathing, swimming) that are safe when there are no crocs, but dangerous when crocodile populations build up. We need to replace the fear of crocodiles among people based on ignorance with being cautious about them based on an understanding of their biology and behaviour. Wildlife conservation is not merely looking after such charismatic species as elephant or leopard but all other flora and fauna that make up the web of life in ecosystems. Hence the need to educate the public to support the conservation of entire ecosystems and their components, including predators and prey. Wetlands such as marshes, bogs, and swamps represent greatly threatened habitats which need public support for maintenance. 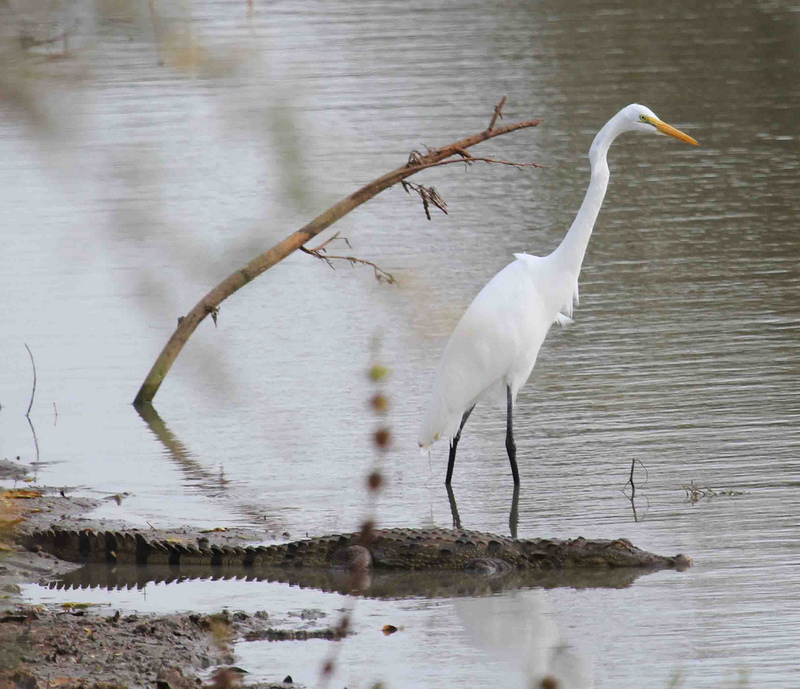 Preservation of healthy wetlands will be the ultimate key to the conservation of crocodiles in Sri Lanka. The value of crocodiles as a natural resource by the people who share the habitat with them can be a powerful incentive to support such conservation initiatives.